Do ya miss me yet? There has been a call from liberal commentators for George W. to come and speak out about the Ground Zero Mosque, after all he made it clear our war was against Extemist muslim terrorist and not against peaceloving Muslims. 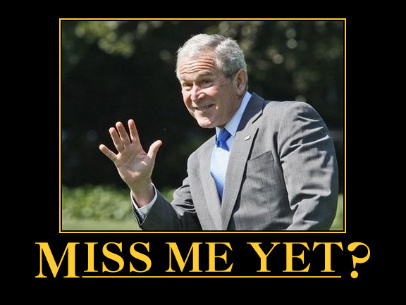 For the moment, with Obama failing to live up to expectations, Bush-bashing is over. What the left might be missing most of all was W’s civility. Few ever doubted his love and respect for the American people. It’s certainly a delicious irony to savor. Of course all of those pundits clamoring for Bush’s assistance are careful to point out that he is still an idiotchimp on every other issue but this one, but I have heard similar “I miss Bush” musings from others–those who always hated Bush, those who grew to hate him, those who piled on because the pile was a safe place to be. And that is it, in a nutshell. Bush is missable, because we miss having a president whose affection for his country and its people–even the ones who hated him–was never in doubt.